Should a fish judge the delicious morsel dangling in front of it (on an invisible hook) according to how delicious it would be to eat it, or according to why it might be there dangling in front of its mouth? As discussed in great detail with lots of online links below*, the ruling class is starting to promote the idea of a Universal Basic Income (UBI). UBI would mean that every adult citizen, without exception, would receive a certain sum of money (the same for everybody) from the government each month. As you can read below*, it isn't just liberal pundits but also conservative ones who are promoting the UBI idea. This may seem paradoxical. But when you finish reading this article you will understand the reason why all of these pundits, both liberal and conservative (all beholden to the ruling billionaire plutocracy), are promoting the UBI idea. UBI is a trap! Many people who want our society to be more equal economically view UBI positively (at first). They very rightly want people who work but who aren't paid for their work, or who aren't paid enough, to get more pay, and they hope UBI will do that. They also worry that robots are replacing all sorts of jobs and pretty soon, they fear, there won't be enough jobs for everybody and those without a job should receive money to live on, as UBI--they hope--will ensure. The problem is that what good people hope UBI will do and what the ruling class intends to do with the UBI idea are two entirely different things. WHY DOES BIG MONEY PROMOTE UBI? There are several Big-Money-connected pundits who love UBI because they want to eliminate all other entitlements (such as Social Security disability payments or payments for specific needs that were formerly called "welfare") and replace them with the UBI check, which, they argue, will cost the government less. Also, as some have pointed out, many people who need substantial government assistance would end up getting less money with UBI than they now get, and these are the poorest among us. Furthermore, giving the same amount of money to everybody clearly does nothing to create greater economic equality. UBI strikes many people as being a freeloader's paradise, because it means that the people who work are taxed to pay money to people who could work but who refuse to work. Most people think freeloading (i.e., taking from others but refusing to contribute back anything despite being perfectly capable of doing so) is morally wrong. Recently the Swiss voted against UBI in a referendum 77% to 23%. The opposition argued that if UBI passed it would make Switzerland a magnet for freeloaders from all over Europe. The ruling class knows full well that UBI will be perceived by most working-class people as a tax on them to support freeloaders. The ruling class also knows that many people in the NPR-listening liberal demographic will view UBI as a wonderful thing that will allow people to be freed from the onerousness of having to work some boring stupid job that a robot should do, and free to pursue their heart's desire. "How cool is that!" The liberals will, the ruling class hopes, support UBI and view working-class folks who oppose it as Neanderthal ignoramuses. And the ruling class also hopes that working-class people will view the NPR-listening demographic as a bunch of pro-freeloader elitist jerks. This, divide-and-rule, is the real reason that Big Money is starting to promote the UBI idea. It's a trap! The ruling class is not going to implement anything that actually makes our society more economically equal, unless there is a very strong movement composed of a large majority of the population that is fighting for it. This cannot happen when half the population is for UBI and the other half opposes it as freeloading, can it? On the other hand, a large majority movement for economic equality can indeed form around the moral principle that the vast majority of Americans DO want the economy to be based upon: "From each according to reasonable ability, to each according to reasonable need or desire, with scarce things equitably rationed according to need." 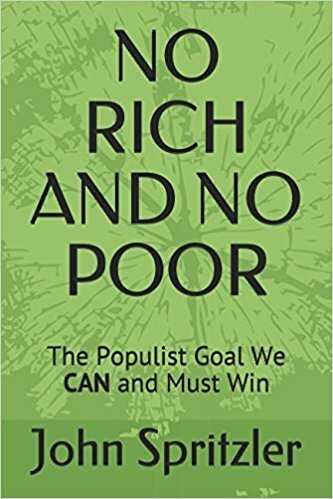 Big Money HATES this principle because, if implemented, it would mean that the billionaire class would no longer have its extreme wealth and privilege and power; the billionaires would be just like everybody else economically. The ruling class tries to suppress any mention of the "From each according..." principle because it knows how unifying that principle is. Instead, the ruling class hopes to use the UBI idea to stigmatize the idea of economic equality as freeloading, to make sure that no large unified movement for economic equality ever forms. Some people reading this may wonder why I'm so worried about people thinking UBI is pro-freeloader. "Who," they may think, "really cares about freeloading? There are too few real freeloaders to care about." But the fact is that working class people DO care very much about freeloading, and they oppose it sharply. This opposition to freeloading can be seen easily in two ways. One way is to just listen to your local conservative talk radio and you'll see that it attracts its audience in large part by condemning freeloading by welfare cheats or illegal immigrants. Another way is to just tell some working class people what the UBI idea is and make sure they understand that it includes sending a check (paid by their taxes) to EVERYODY no matter what, and see how they react. Most don't like the idea of paying taxes to people who could, but just refuse to, do any work. The reason working class people are particularly concerned about freeloading is that our society is one in which a ruling upper class is a freeloading upper class (how else can three individuals own more wealth than the bottom half of the U.S. population?) that treats the rest of us like dirt. People know that the biggest freeloaders are powerful and that it's dangerous to condemn them explcitly, so they express their anger at freeloading by talking about little (real or imagined) freelodaders at the bottom of society. The point is that any movement against the ruling class that expects to become a truly mass majority movement cannot ignore the fact that many people, for very good and understandable reasons, dislike freeloading very very much. Capitalists have been replacing human labor with machines for hundreds of years. They do this whenever it lowers the cost of production. No doubt the trend will continue, with robots doing more and more things once done by humans. But this does not mean that the world will be a good world when robots do all the work and humans do none of it. In a good world, robots will do as much of the unpleasant or boring or dangerous work as possible, and humans will do things (many of which were never done before at all!) FOR EACH OTHER to make the world even better than it is today. For example, in the past most people had to work on farms to produce our food, and NOBODY created computer games. Now very few people are required to plow farm fields and instead people are freed from that task to do things such as create computer games (and perform in theatrical productions and be medical-research scientists, etc.). What makes for a better world is when people contribute reasonably according to ability toward making it a better world for each other. In a good world like this, the principle is "From each according to reasonable ability, to each according to reasonable need or desire, with scarce things equitably rationed according to need." It would be a terrible world, however, if people no longer did things to help make it a better world for each other. This is true no matter how much robots do. A world in which people used the ubiquity of robots as an excuse for not doing anything to make life better for others is a nightmarish world, and its principle is the freeloader's principle: "Take from others but don't give anything in return even if you are able to." This is why people (such as Robert Reich who calls robots "i-everything" devices) who defend UBI by arguing that "Soon robots will do all the work and people will all need to be paid to do nothing" are wrong. No! Robots will NEVER do all the work, unless it's a nightmarish world based on the freeloader principle where sick people have nothing but robots caring for them and the only entertainment is provided by robots and so forth. It is true that the ruling class may want this nightmarish world with the same class inequality we have today, justified by the idea that ordinary people are useless because robots do all the work; all the more reason for us to oppose it! For lots of discussion about building a movement to remove the rich from power to have real, not fake, democracy with no rich and no poor, please visit www.PDRBoston.org. Charles Murray, co-author of The Bell Curve, a book that asserts that black people are on average less intelligent than whites, writes----in the Wall Street Journal, no less--that "A Guaranteed Income for Every American: Replacing the welfare state with an annual grant is the best way to cope with a radically changing U.S. jobs market—and to revitalize America’s civic culture." Murray also advocates UBI in his 2006 book, In Our Hands. Forbes Magazine (which calls itslef "The Capitalist Tool") published an article titled "Universal Basic Income Is Not Crazy." "The welfare system grew up to service a model of industrial modernity. It is failing the poorest in society and may be at risk from technological upheaval. It may yet need a radical redesign." "Absurd as a minimum income might seem to bootstrapping Americans, one already exists in a way — McDonald’s knows it. If our economy is no longer able to improve the lives of the working poor and low-income families, why not tweak our policies to do what we’re already doing, but better — more harmoniously? It’s hardly uplifting news, but minimum incomes just might be stimmig for the United States too." Readers of this article were informed that the word "stimmig" "means something like 'coherent and harmonious,' with a dash of 'beauty' thrown in." Andy Stern, former president of the Service Employees International Union (and not particularly loved by working people, apparently, as seen here and here), was invited to write his Opinion piece for the New York Times promoting UBI. He concludes with, "A universal basic income can help Americans and America prepare for the future." Actually, UBI has been advocated by far more intellectuals and political figures than cited by the Washington Post. Here is a very long list of famous advocates of UBI. Robert Reich is promoting UBI, and likewise the Green Party (II D e in its platform). “Machines, the argument goes, can take the jobs, but should not take the incomes: the job uncertainty that engulfs large swaths of society should be matched by a welfare policy that protects the masses, not only ‘the poor’,” said World Bank senior economist Ugo Gentilini.